Why sigh if summer be done, and already grey skies, like a pall, hang over fog-choked London town? The sun may shine, wild winds may blow, but every evening brings with it the happy dinner hour. With the autumn days foolish men play at being pessimists, and talk in platitudes of the cruel fall of the leaf and death of love. And what matter? May they not still eat and drink? May they not still know that most supreme of all joys, the perfect dish perfectly served? Small indeed is the evil of a broken heart compared to a coarsened palate or disordered digestion. “Therefore have we cause to be merry!—and to cast away all care.” Autumn has less to distract from the pleasure that never fails. The glare of foolish sunlight no longer lures to outdoor debauches, the soft breath of the south wind no longer breathes hope of happiness in Arcadian simplicity. We can sit in peace by our fireside, and dream dreams of a long succession of triumphant menus. The touch of frost in the air is as a spur to the artist’s invention; it quickens ambition, and stirs to loftier aspiration. The summer languor is dissipated, and with the re-birth of activity is re-awakened desire for the delicious, the piquante, the fantastic. Let an autumn dinner then be created! dainty, as all art must be, with that elegance and distinction and individuality without which the masterpiece is not. Strike the personal note; forswear commonplace. The glorious, unexpected overture shall be soupe aux moules. For this great advantage it can boast: it holds the attention not only in the short—all too short—moment of eating, but from early in the morning of the eventful day; nor does it allow itself to be forgotten as the eager hours race on. At eleven—and the heart leaps for delight as the clock strikes—the pot-au-feu is placed upon the fire; at four, tomatoes and onions—the onions white as the driven snow—communing in all good fellowship in a worthy saucepan follow; and at five, after an hour’s boiling, they are strained through a sieve, peppered, salted, and seasoned. And now is the time for the mussels, swimming in a sauce made of a bottle of white wine, a bouquet-garni, carrot, excellent vinegar, and a glass of ordinary red wine, to be offered up in their turn, and some thirty minutes will suffice for the ceremony. At this critical point, bouillon, tomatoes, and mussels meet in a proper pot well rubbed with garlic, and an ardent quarter of an hour will consummate the union. 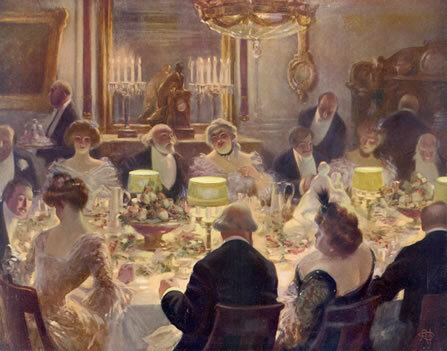 As you eat, something of the ardour becomes yours, and in an ecstasy the dinner begins. Sad indeed would it prove were imagination exhausted with so promising a prelude. Each succeeding course must lead to new ecstasy, else will the dinner turn out the worst of failures. In turbot au gratin, the ecstatic possibilities are by no means limited. In a chaste silver dish, make a pretty wall of potatoes, which have been beaten to flour, enlivened with pepper and salt, enriched with butter and cream—cream thick and fresh and altogether adorable—seasoned with Parmesan cheese, and left on the stove for ten minutes, neither more nor less; let the wall enclose layers of turbot, already cooked and in pieces, of melted butter and of cream, with a fair covering of breadcrumbs; and rely upon a quick oven to complete the masterpiece. After so pretty a conceit, where would be the poetry in heavy joints or solid meats? Ris de veau aux truffes surely would be more in sympathy; the sweetbreads baked and browned very tenderly, the sauce fashioned of truffles duly sliced, marsala, lemon juice, salt and paprika, with a fair foundation of benevolent bouillon. And with so exquisite a dish no disturbing vegetable should be served. And after? If you still hanker for the roast beef and horseradish of Old England, then go and gorge yourself at the first convenient restaurant. Would you interrupt a symphony that the orchestra might play ” God save the Queen”? Would you set the chorus in “Atalanta in Calydon” to singing odes by Mr. Alfred Austen? There is a place for all things, and the place for roast beef is not on the ecstatic menu. Grouse, rather, would meet the diner’s mood— grouse with memories of the broad moor and purple heather. Roast them at a clear fire, basting them with maternal care. 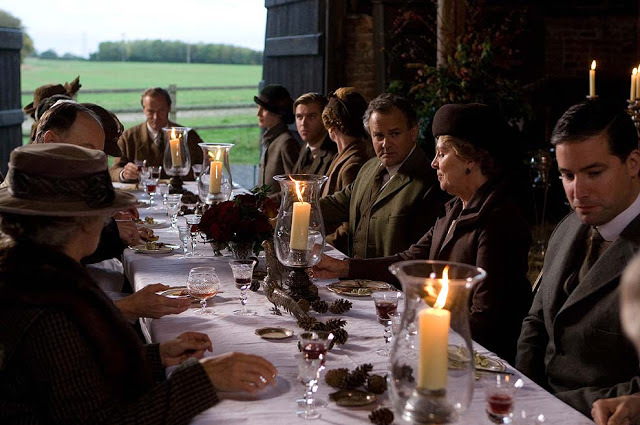 Remember that they, as well as pheasants and partridges, should “have gravy in the dish and bread-sauce in a cup.” Their true affinity is less the vegetable, however artistically prepared, than the salad, serenely simple, that discord may not be risked. Not this the time for the bewildering macédoine, or the brilliant tomato. Choose, instead, lettuce; crisp cool Romaine by choice. Sober restraint should dignify the dressing; a suspicion of chives may be allowed; a sprinkling of well-chopped tarragon leaves is indispensable. Words are weak to express, but the true poet strong to feel the loveliness now fast reaching its climax. It is autumn, the mood is fantastic: a sweet, if it tend not to the vulgarity of heavy puddings and stodgy pies, will introduce an amusing, a sprightly element. Omelette soufflée claims the privilege. But it must be light as air, all but ethereal in substance, a mere nothing to melt in the mouth like a beautiful dream. And yet in melting it must yield a flavour as soft as the fragrance of flowers, and as evanescent. The sensation must be but a passing one that piques the curiosity and soothes the excited palate. A dash of orange-flower water, redolent of the graceful days that are no more, another of wine from Andalusian vineyards, and the sensation may be secured. By the law of contrasts the vague must give way to the decided. The stirring, glorious climax after the brief, gentle interlude, will be had in canapé des olives farcies, the olives stuffed with anchovies and capers, deluged with cayenne, prone on their beds of toast and girded about with astonished watercress. Fruit will seem a graceful afterthought; pears all golden, save where the sun, a passionate lover, with his kisses set them to blushing a rosy red; grapes, purple and white and voluptuous; figs, overflowing with the exotic sweetness of their far southern home; peaches, tender and juicy and desirable. To eat is to eschew all prose, to spread the wings of the soul in glad poetic flight. What matter, indeed, if the curtains shut out stormy night or monstrous fog? Rejoice that no blue ribbon dangles unnecessarily and ignominiously at your buttonhole. Wine, rich wine to sing in the glass with “odorous music,” the autumn dinner demands. Burgundy, rich red Burgundy, it should be; Beaune or Pomard as you will, to fire the blood and set the fancy free. And let none other but yourself warm it; study its temperature as the lover might study the frowns and smiles of his beloved. And the Burgundy will make superfluous Port and Tokay, and all the dessert wines, sweet or dry, which unsympathetic diners range before them upon the coming of the fruit. Drink nothing else until wineglass be pushed aside for cup of coffee, black and sweet of savour, a blend of Mocha and Mysore. Rich, thick, luxurious, Turkish coffee would be a most fitting epilogue. But then, see that you refuse the more frivolous, feminine liqueurs. Cognac, old and strong-hearted, alone would meet the hour’s emotions—Cognac, the gift of the gods, the immortal liquid. Lean back and smoke in silence, unless speech, exchanged with the one kind spirit, may be golden and perfect as the dinner. In Yorkshire, when driving grouse late in the season on a well-known moor, we had for lunch most delicious pies made with grouse, rabbits, and potatoes, and although they had to be brought some six or seven miles from the lodge, they were as hot as if they had just come out of the oven, having been carried in a clothes basket wrapped up in blankets. The blankets must be new one?. The Yorkshire folk take a lot of beating in the way of pie making. Abroad, the English are credited with possessing a hundred religions and one sauce; but thanks to the many excellent schools of cookery which have been established of late years all over the kingdom, the latter half of the statement at any rate is now incorrect, though what was once sauce for the gander is more than ever considered sauce for the goose. Seriously speaking, the career of cook and the pursuit of cooking as a practical art, is one of the few ways of gaining a livelihood left comparatively open to the average intelligent girl who finds herself thrown on the world at an age when a long apprenticeship or the acquirement of a regular profession are out of the question. There is a constant and unceasing demand for good plain and high-class cooks, and this both in town and country. A methodical young lady with some knowledge of account-keeping added to her culinary knowledge can easily earn as head cook in a large establishment far move than even a well-paid literary secretary acquainted with shorthand and typewriting, and, what is more, her pecuniary value as cook will increase as the years go on, instead of diminishing, as is the case with almost every other kind of work. Another, and to main’ a pleasanter, way of turning culinary and general knowledge to account is to take a position as teacher or lecturer under the auspices of the local School Boards and of the County Council. Tin’s opens up a sphere of agreeable work for those who possess a fair education, and the life led by a lady lecturer armed with the necessary diplomas, is infinitely freer and more agreeable than that led by a governess or companion—the more so that the teacher has much of her time to herself, part of which she is generally allowed to devote to private tuition, which sometimes takes the form, in country districts, of a demonstration lecture and a practical lesson given in the roomy kitchen of some historic country house. It should be added, however, that the demand for cooking teachers and lecturers has lately decreased owing to the greater supply and to the fact that Board-School teachers are now qualifying themselves to add a practical and theoretical knowledge of cookery to their other subjects. Thanks to the energetic efforts of a few sensible men and women, notably the late Countess of Rosebery, the Hon. E. F. Leveson-Gower, Miss Guthrie Wright, Miss L. Stevenson, and, last but not least, Mrs. Charles Clarke, the capable and kindly Lady Superintendent of the London National Training School for Cookery, there is now no large town lacking adequate cookery tuition. Those, especially girls, who are compelled to earn their own living, too often find themselves from the first face to face with the difficult “ways and means ” problem. But, nowadays, a certain amount of thorough training must be’ gone through before even the most practical woman can hope to obtain regular and fairly paid employment, and the time and money spent in obtaining a cooking diploma or certificate, could not, in many cases, be better laid out; while those parents who are willing to add what may, under many circumstances, prove to be an invaluable possession to their daughters’ general requirements, cannot do better than let them acquire a knowledge of, at least, good plain cookery. Although single lessons and complete courses of tuition in special branches of cookery can be taken without any reference to time or ultimate object, it is always better to try for a certificate or diploma. At the National Training School (now established in Buckingham Palace Road, S.W.) a Plain Cookery certificate can be obtained after five weeks’ regular attendance, and for a fee of £5 5s. In exchange for this comparatively modest sum a pupil is initiated into the mysteries of roasting and boiling meat and poultry, taught all plain sauces and gravies, and also many appetising ways of preparing cold meat. A course of soups and stews is included, as, also, twelve ways of cooking fish; some cheap dishes are added, and vegetables, pastry, puddings, sweets, cakes, breakfast dishes, and, what is, perhaps, the most important of all, a practical course of sick-room cookery. Each pupil is expected to prepare and dish up a plain dinner of four or five courses during the five weeks of the training. Those who wish to obtain a teacher’s diploma have a far longer and more expensive course of training to go through. No student is admitted under eighteen or over thirty-five years of age. Students must also be able to pass in common arithmetic, and their speaking, writing, and spelling will all be taken into account during the examination; for a considerable portion of a teacher’s work may lie in demonstration lectures, and clear, distinct enunciation is of importance. Before a student is qualified for a Teacher’s diploma she must have attended the school during thirty weeks, that is seven. to eight months. The fee is £20, payable in three installments, each in advance. Pupils are only admitted on the first Monday of every month, and though the rules are few, they must be obeyed; thus, students in training are expected to be at the school every day (except Saturday) at a quarter to ten, and they seldom leave before half-past three. A medical certificate is the only excuse for absence. The above particulars not only refer to the National Training School, but apply in great measure to most of the larger provincial schools, where, however, notably, in the Edinburgh School of Cookery and Domestic Economy (3, Atholl Crescent, Edinburgh), many other subjects, such as dressmaking, knitting, plain needlework, millinery, and lectures on hygiene, are added to the cookery classes. A visit to the National Training School of Cookery is a delightful experience, especially if the tour of inspection is taken in company with the Lady Superintendent herself. Mrs. Clarke has seen pass through her hands something like fifty thousand young people, and her heart is in the work to which she has now devoted twenty years of her life. Gas stoves play such a part in the latter-day kitchens that many mistresses of small households may like to hear that all the lessons in the National Training School are given on luminous gas stoves; a plain cookery course is often given to the general servant of some lady willing to pay the fee and put up with the temporary absence of some “household treasure” who lacks a knowledge of the culinary art to make her perfect; while not infrequently are to be found among the students young matrons turning their leisure to the best account by the acquirement of a few dainty entrees or savouries easily passed on, when once learnt, to any good plain cook. A special feature is made of artisan cookery; and it is impossible to calculate the difference, as regards health and subsequent happiness, which would be attendant on anything like a wide dispersion of the knowledge here instilled in those students who are trained with a view to the Artisan and Household Cookery Diploma. To take but one section—that concerned with the practical knowledge of scullery work. Many a workman’s wife is, when she marries, ignorant of the best way of lighting, managing, and economising a fire; still fewer understand the regulation of heat in an oven, or the management of an open and close range. The knowledge of these and kindred matters has, as often as not, to be obtained by hard and bitter experience, and at the cost of weeks of ill-health and general discomfort. In connection with this and certain provincial schools of cookery, lady pupils training for teachers are boarded for something like 25s. to 35s. a week. Also, day pupils can obtain their lunch on the premises. Classes for training teachers in needlework and dressmaking will be opened this month (September), the fee being £5 5s., and the time of training four months. People not infrequently decry the value of theoretical and, if I may so style it, scientific knowledge versus acquirement of the practical side of cookery. To these the following little true story is addressed. A teacher carefully explained to a country class the mystery of game-pie making, but omitted to insist on and explain the necessity for making a hole in the crust in order that the steam and deleterious gases might escape. The receipt was faithfully worked out by some of the pupils on their return home; but, as may be imagined, they omitted this necessary item and the most disastrous results ensued. Similar instances might be multiplied indefinitely. 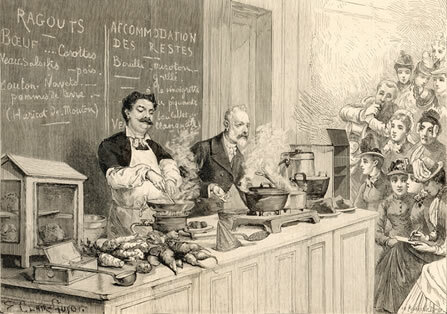 And those who wish to really benefit to the full by any training school should make a point of attending the lectures on the chemistry of food, which include such practical subjects as the methods of preserving food, and the action of heat and of the several processes of cooking, on food.